To be Christian and enter into God’s covenant of salvation, we need the Sacraments of Initiation, beginning with Baptism. Persons wishing baptism (for their children) need to call the parish office (3) months prior to the preferred time to receive the Sacrament. 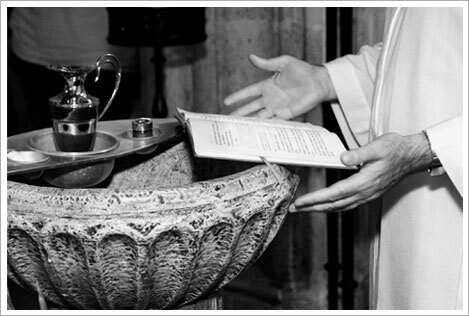 Families must be registered with the parish in which the baptism will occur or a letter from their pastor needs to be sent to the parish in advance of the celebration. Please see below for the covenant for next year’s preparation. Catholics follow Christ’s teaching (John 6: 22-69) to consume His Body and Blood in the Eucharist. Reception of this Sacrament requires a 2-year sacramental preparation process by attending our Sunday Catechetical Program and regular attendance of Mass for two years leading up to the celebration. Those wishing to receive the Eucharist in First Holy Communion need to contact the Parish Office. Those who were baptized as infants should receive the Sacrament of Confirmation when they are mature enough and desire the Sacrament for him/herself. This is a 2-year preparation process. Please see this page for the covenant for next year’s preparation. For more information, please contact the Parish Office.